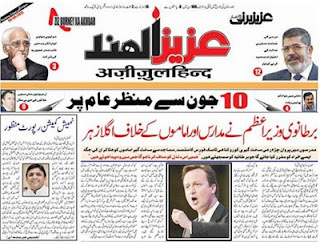 Aziz Burney launches Urdu daily newspaper Azizul Hind, will he be successful again? [and establish], Burney was silent for almost two years. Now, he has come up with plan for an entire media house that includes newspaper editions from different states, English and Hindi daily newspapers, magazines and weeklies apart from TV channels. India. His full page editorials that began during the invasion on Iraq and his later 'Azad Bharat ka Itihas' series that was published in both Urdu and Hindi in Sahara, invited readers' attention while he also got flak from certain quarters. Still, he proved that running an Urdu daily newspaper could still be a profitable venture in India.The success of Sahara, which now has edition from ten cities across India, led to rise of new dailies like Sahafat, Aag and the expansion of Inquilab afer Jagran group bought it. Clearly, despite the criticism, he energized Urdu media scene. Questions remain about his agenda, intent and whether he could have been more responsible. Doesn't everyone have an agenda? Eminent Urdu writer Musharraf Alam Zauqi in his recent article about the impending launch of Aziz-Ul-Hind, expressed his apprehensions about Burney's new media venture. Zauqi mentioned that Burney's journalism thrived on sensationalism, which didn't help Muslims understand and tackle their real issues. He said that new generation of Muslims shouldn't get caught into emotional traps and look towards future, rather falling for those who use emotional sloganeering to catch their attention. There are other accusations like the famed journalist's political aspirations and his 'shakhsiyat-parasti' or projecting himself too much. Many other journos harbour similar ambitions. Criticism aside, it is not correct to see things in black and white only. Zauqi is also an intellectual and his concerns could be genuine. But it is premature and unfair to judge so early. Burney has had a long innings in journalism. Now, he has come with another paper. Those who oppose him or have issues with his style can better come up with their own plan for newspaper or channel. Else, they should keep writing and expressing their dissent strongly. Healthy criticism is good for society. Roznama Sahara published positive stories and did constructive journalism as well. While some of his Burney's theories and his articles may not be palatable, he did raise questions and spoke [and wrote] fearlessly. In case of firing at Gopalgarh in Congress-ruled Rajasthan and riots in towns in Samajwadi Party-ruled UP, Sahara set new standards in journalism, by going to the spot immediately in the aftermath of the incidents, and posing tough questions before the 'secular' regimes. Burney's plans are indeed ambitious. He has announced starting editions of Urdu daily from Lucknow, Delhi, Bhopal, Patna this month. Can he amass such gargantuan funds that are needed for running this huge new media group [empire]? Using Facebook and Twitter to create a stir, connect with readers, he announced the 'media plan'. It does seem a bit complicated but he has said that it would be a trust that would run these newspapers and other publications. 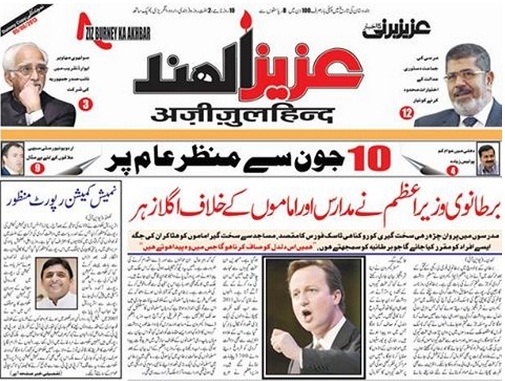 Amid the presence of large number of Ulema [Islamic scholars], the Urdu daily has been launched. Let's wait and watch. Give him sometime before we judge his new venture in terms of positive journalistic practices and success. 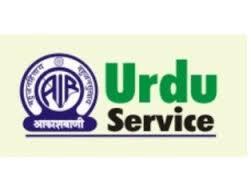 The famed Urdu service of the All India Radio (AIR), which kept generations of radio lovers hooked, is finally available to the audiences across the world. For years, the dedicated followers of Urdu service, struggled with the knobs on the radios, in order to catch the service. At times it worked and then the voice would suddenly vanish. The reason was that transmission wasn't strong in most parts of the country, except regions in North viz. Punjab and Kashmir. The service is now available online 24/7. Also, you can tune it on the internet, listen it through your laptop or cell phone without worrying about the frequency or KHZ. The AIR Urdu service's link is here. In fact, the AIR radio channel has been available on most digital networks [DTH] and for sometime now and can be heard on TV also. With growing digitisation of cable, it will hopefully have even greater reach. I still remember how a shop owner from Maharashtra, who stayed near my house, daily tuned in to the Urdu service station in the afternoon. For hours, one could hear lovely songs. The choice of Bollywood songs and music made it a hit with the non-Urdu walas. Mind you, in those days, there was just a single TV channel--Doordarshan, that too for a few hours in the evening. So entertainment still meant radio. Not just music and news, the AIR Urdu service, aired literary programmes, dramas, interviews and almost everything you can think of throughout the day. Just have a look at the list of programmes at this link. Just today I tuned in the station, and at 3 am, an interesting soap opera was being aired. The Urdu service was started in the seventies. I often heard that it was to counter the influence of neighbouring country's radio and TV in bordering areas. The fact is that the Urdu service succeeded and it had a cult following. Even today, there are lovers of the AIR Urdu service, just like Vividh Bharti fans, spread across India. In towns in UP, Bihar, MP and Rajasthan, you find numerous people who wait eagerly with transistors [remember the word!] to listen to the service. In those days, just like catching BBC Urdu or Hindi service, it was a tough job to catch AIR Urdu service. People tried all sorts of methods. There were mechanics who specialised in this art. The buyer often asked the radio seller to ensure that the 'sui' [needle] was specially adjusted and attuned for the BBC or Urdu service. Some radio mechanics used a long metal strip on which a wire was fixed, to serve as an extension for the antenna. Last year only, a mechanic told me that he was still doing it. Yes, every home in India doesn't have a laptop yet. All these efforts are made to catch the radio services which were not in Medium Wave but seemed floating [or lost] somewhere in the Short Wave. Today, its the era of FM. But the stories remain. And so does the AIR Urdu service. Thank God. Information & Broadcasting (I and B) ministry must be congratulated for turning tech-savvy and saving the service. So what are you waiting for? Feeling nostalgic! Just click and listen to the melody AT THIS LINK.